No matter the goal aesthetic or functional design of your home or business, shutters are a great option for achieving your desired look and feel for your space. They offer flexibility in design as well as nearly endless possibilities for function design and shape. 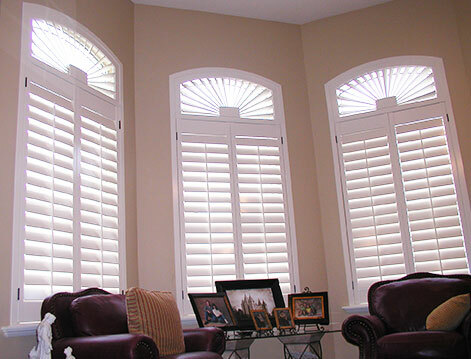 Not to mention, custom shutters also add a touch of class and sophistication to any room. To help you find the right shutters for you, we’ve provided the list of shutter types below. Check it out then get started on the process of designing a great set of shutters! This shutter style provides full shutter functionality without the opening and closing rod in the middle. The rod is placed in the back of the shutter for a unique design. No matter the shape or size of your window, a custom shutter can be made to fit it. Stanfield has covered windows of oval, octagon, circle, arch, angle to square and rectangular shapes. This arch design allows for full functionality and shading of arched windows and doorways. The incorporation of a jalousie rod connecting the upper and lower louvers allows for functionality of both the top and bottom pieces. Whether you’ve used a stained glass window or a custom shape, we can cover it with gorgeous shutters that highlight its unique design. Sunburst arches offer a gorgeous look with tilted panels that are fully functional. Stanfield was the first to create this shutter style. Sidelights on doorways provide light and openness to any room. They can however, be a bit difficult to cover for privacy. Custom shutters allow you to cover these difficult areas, increasing privacy and adding a gorgeous decorative appeal. Covering a sliding glass door with a quality fixture is no easy feat. Custom shutters offer a fully functional and convenient fixture for sliding glass doors that won’t break or get in the way. Finding a good way to cover your French doors can prove extremely difficult. Rather than struggle with pesky curtains or blinds, install a custom set of shutters that will stay in place with full functionality and appeal for years to come. This style allows users to operate each section of the shutter separately from the other. This is great for optimal light control in a room. These are only some of the many types of custom shutters that can be created here at Stanfield. For more information or to get started, visit our contact page!